The woman was taken to Mayo University Hospital and was pronounced dead a short time later. The incident took place on the Westport road. GARDAÍ ARE INVESTIGATING a fatal car crash that took place outside Castlebar, Co Mayo, this morning. 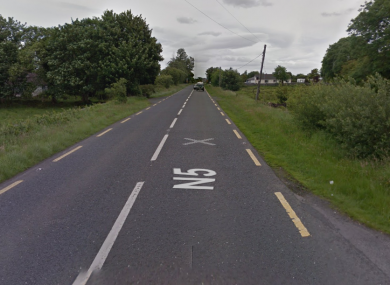 The two car collision took place at 8.30am on the Westport road (N5) on the outskirts of the town. One of the drivers, a woman in her mid 60s, was rushed to Mayo University Hospital but was pronounced dead a short time later. The second driver, a man in his mid 30s, was also taken to the hospital with minor injuries. Garda Forensic Collision Investigators are currently at scene of the crash. The road has been closed and local diversions are in place. Gardaí are appealing to anyone who may have witnessed the collision or has information to contact Castlebar Garda Station on 094 – 9038200, the Garda Confidential Line 1800 666 111 or any Garda Station. Email “A woman in her 60s has been killed in a car crash in Mayo”. Feedback on “A woman in her 60s has been killed in a car crash in Mayo”.